Earth is inside a solar wind stream flowing from this ill-defined coronal hole. Image credit: SOHO Extreme UV Telescope. ALIEN LIGHTNING: NASA's Cassini spacecraft is tracking an intense lightning storm on Saturn. The powerful bolts are causing the spacecraft's radio instruments to "crackle"--much like the crackles you hear coming from your car's AM radio when you drive by a thunderstorm on Earth. One difference: Saturn's lightning is about 1000 times stronger than Earth's: full story. If you have a safely-filtered solar telescope, take a look. It's a nice way to celebrate Galileo's birthday. more images: from John Stetson of Falmouth, Maine; from Robert Arnold, Isle of Skye, Scotland; from Gary Palmer of Los Angeles, California; from Andy Dodson of Huirangi, New Zealand. HAPPY BIRTHDAY, GALILEO: On February 15, 1564, Galileo Galilei was born in Pisa, Italy. If he were alive today he would be 442 years old. Galileo is an important person in the history of space weather. Contrary to popular belief, he didn't discover sunspots, but he was one of the first to observe them using a telescope. In Galileo's day, many people believed sunspots were satellites of the sun. Galileo proved otherwise. By drawing sunspots every day, he discovered that the sun spins and that sunspots are located on (or very near) the sun's surface. Galileo thought sunspots might be clouds. Sunspots drawn by Galileo in June 1612: more. Now we know what sunspots really are: great islands of magnetism. 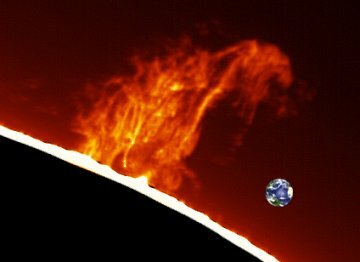 Sunspots consist of magnetic force fields poking through the surface of the sun. These fields block the flow of heat from below. Because sunspots are a few thousand degrees cooler than the surrounding inferno, they appear dark. Typical sunspots are a few times wider than Earth. The behemoths Galileo sketched in 1612 were as wide as Jupiter. You are visitor number 33756769 since January 2000.